In 2016 BRIDGE’s Teacher Development Community of Practice (CoP) explored elements of teacher development as it relates to the various stages of a teaching career, from pre-service to retirement. This is an area the CoP will continue to focus on going forward in 2017. In the CoP’s first meeting of the year, members explored the Integrated Strategic Planning Framework for Teacher Education and Development in South Africa 2011-2025 (ISPFTED). The framework puts forward a range of education and development opportunities for teachers and student teachers aimed at improving the quality of teaching and learning in South African schools. Haroon Mahomed, Director for Continuing Professional Development in the Department of Basic Education, updated the CoP on the current position of the ISPFTED, some of the challenges to implementation and the steps government has considered to take the framework forward. -Teacher development’s ‘stepchild’ status and the related constraints on funding. An example is the absence of funds to develop the online diagnostic assessment system, which the plan features prominently as the basis for identifying development needs and opportunities. -The lack of urgency, agency and accountability at provincial level towards providing for teacher development. An example is the late submission of SDL applications to the ETDP SETA. -The lack of access to meaningful teacher development opportunities that can really make a difference. Reasons for this are numerous and include the absence of hard data to inform provision, a lack of provincial commitment to justify Higher Education investment in programme development, limited provider capacity, and a lack of awareness as to what is available. 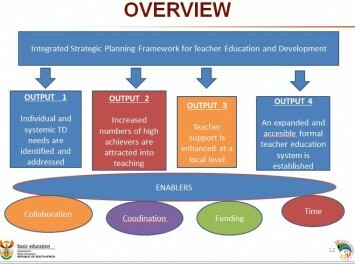 -Building capacity to conduct monitoring and evaluation and obtain the evidence-based data needed to determine progress and prioritise work on teacher development; exerting pressure to use the ANAs and NSC diagnostic reports to inform teacher development programmes, and to show that teacher development interventions lead to improved results. -Supporting collaboration between private providers, universities, government and unions to avoid duplication and increase the capacity of the system to provide meaningful teacher development. -Exerting pressure on the provinces – as the main engine of delivery and development in education – to implement the provisions of the plan and work towards achieving the specified outcomes. -Prioritising short course interventions to improve subject knowledge (together with practice-based ACE programmes for school leadership and management), training mentors and lead teachers, developing a L5 Grade R/ECD diploma and developing specialist qualifications for special needs education (slide 17). It’s important to note that action on these items depends on the provinces. To learn more about this Community of Practice, click here.